You don't often see a 12-foot steampunk eagle-thing bursting out of a brick wall, but Irrational Games' 'Him' booth at PAX East featured exactly that. If you attended PAX East, you saw Him. Hanging out in the main lobby of the convention center, it was impossible to miss the 12 foot tall steampunk eagle grasping at attendees and menacing the actress dressed as Elizabeth, a character from Irrational's upcoming game Bioshock Infitite. Ever wonder how these immense Con-worthy dioramas are made? According to a post on Irrational's site, it takes a lot of time, foam, and intensive sketching. 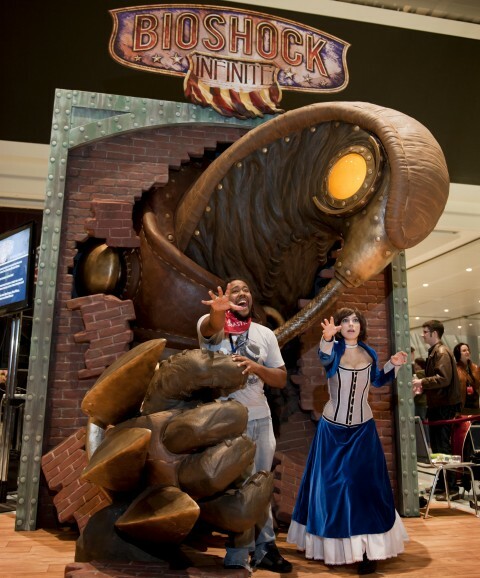 The original idea was quite simple: Make a diorama for PAX East to wow the attendees and promote Bioshock Infinite. When the the idea was pitched to Robb Waters, a concept artist at Irrational, inspiration struck, and he whipped up a basic design plan. The plan was finalized and zipped over to the team that would actually attempt to build the gargantuan bird-thing. The construction team sent photo updates to Irrational's main offices, showing how Him was coming along. 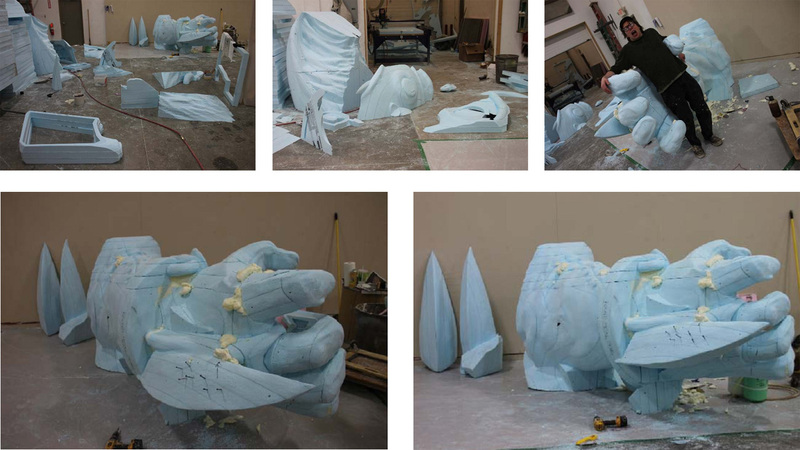 Over the course of 17 days, the diorama went from a jumble of weird foam shapes to a recognizable fist, to a giant bird head, to a fully assembled terrifying steampunk bird-thing. Even unpainted it was damn impressive. "When we got these shots, the scale of the project finally became truly apparent," writes Irrational's Community Manager, Chris Remo. "Seeing Him assembled and upright, even in this rough form, was a stirring moment." Finally, as the first day of PAX East approached, it was done. The mammoth construct stood in the main lobby of the Boston Convention Center, an astounding promotion for Bioshock: Infinite. People were able to really step into the world of the game - and into the hands of Him. There was only one problem: he's just too damn big to keep at the office. So the giant diorama has been put on the road to various gaming events. Where will he be heading? "We're actually not sure," says Remo, "but expect to see Him again."